© 2019 Sabater N, et al. This is an open-access article distributed under the terms of the Creative Commons Attribution License, which permits unrestricted use, distribution, and reproduction in any medium, provided the original author and source are credited. To evaluate outcomes of alcohol delamination of the corneal epithelium as a treatment for symptomatic ocular surface irregularities. 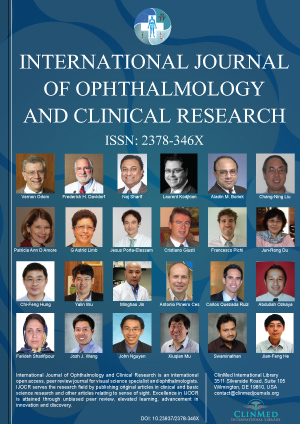 A retrospective analysis of 10 eyes of 10 patients with corneal epithelial irregularities (9 with recurrent erosion syndrome and 1 Salzmann nodule) who were treated with alcohol delamination between November 2015 and January 2018 was conducted. All patients achieved success, defined as complete resolution of symptoms for at least one month. However, continued success (defined as complete resolution of symptoms for at least one year) was achieved in only 70% of them. One of them had not enough follow up to apply this definition and the other two had relapses of soreness before a year. One of them had a new alcohol delamination of the epithelium and after 6 months being still symptomatic, a phototherapeutic keratectomy was performed achieving resolution of symptoms. The other was asymptomatic for 3 months and then started to have episodes of soreness every 6-8 weeks. After intensive lubrication for 10 months with no improvement, treatment with plasma rich in growth factors eye drops was started. After six months the patient reported no symptoms. Alcohol delamination is a good treatment for symptomatic corneal irregularities when intensive lubrication does not improve the condition. If that treatment fails, a new alcohol delamination, phototherapeutic keratectomy or plasma rich in growth factors eye drops are good second line alternatives. Noelia Sabater, Admiravision, Barcelona, Spain, Tel: +34-932275667, Fax: +34-932275662.